Cuernavaca, also known as the "city of eternal spring" is a privileged place in the world, its climate is considered ideal to maintain pleasant temperatures almost all year. Cortes, with its 450 years of existence; Teopanzolco archaeological site near the center of Cuernavaca; Jardin Borda, one of the few preserved colonial gardens, has fountains and a pond, plus a beautiful vegetation which at the time were unknown here in Mexico, and were brought from the Far East and the Philippines; Cathedral, old Franciscan ex-convent now declared a World Heritage Site by UNESCO; the spire of the ordeal, the little castle museum, numerous canyons, jump San Anton, ethno-botanical museum are just some of the attractions we have for you, come and enjoy all that Morelos has to offer! The Palacio de Cortes was completed in 1535; the Cathedral, showing architectural constructions from different periods; the convent and church of the Third Order of Franciscans dating from the sixteenth century; the chapels of the Calvary or Chapitel of the Calvary, consecrated to the Virgin of Guadalupe and erected in 1939; that of Tepetates and the open chapel of St. Joseph, built in the sixteenth century; the shrine of Our Lady of Miracles, located in the district of Tlaltenango; the Church of the Guadalupita; Hacienda de Atlacomulco; the aqueduct of the seventeenth century; the kiosk of the Garden of Heroes; the bridge of Porfirio Diaz; the railway station; Casa del Olvido (or the Olindo) in the neighborhood of Apatzingo; the Jardin Borda and accompanying church and bridge Devil's Alley, among the most important. There is an archaeological site in Teopanzolco, which was ancient ceremonial center of Tlahuicas, who raised two concentric structures separated by a moat, possibly dedicated to Quetzalcoatl. SculpturesAltarpiece of the chapel of the Third Order, built in the seventeenth century. PaintingsMurals of Casino de la Selva, painted by David Alfaro Siqueiros; paintings of the temple of the Third Order depicting the martyrdom of the first Mexican saint, Felipe de Jesus; frescoes in the convent of the Third Order; paintings on the life of Maximilian and Carlota at City Hall; and murals in the Palacio de Cortes painted by Diego Rivera. Showrooms in the Garden BordaVelasco Tamayo roomSala RiveraSala SiqueirosSection JuarezHouses of CultureMorelos Center for the ArtsChildren's Cultural Center "The Neighborhood"
Carnival is a tradition of Cuernavaca from 1965. Flower Fair was established in 1965, which begins on May 2 and ends on day 12. In the Borda garden, flower growers throughout the Republic, present the most beautiful flowers they grow, competing for the annual award. 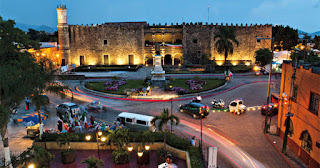 The flower show has great importance in Cuernavaca. Popular fairsFlower Fair is held at the beginning of spring, there rides, an arena, horse races, shows and cultural events are installed; May 15, the feast of San Isidro Labrador; June 13, the feast of San Antonio in the neighborhood of San Anton, with fireworks, Aztec dancers and middens; August 6, the feast of El Salvador or of the Transfiguration of the Lord of Ocotepec, with dances of Moors and Christians, mole and pulque; August 10, the feast of San Lorenzo in Chamilpa; August 15, the feast of the Assumption of the Blessed Virgin in Santa Maria Ahuacatilán; September 8, feast of Our Lady of Miracles in Tlaltenango, with important fair that attracts numerous visitors; and December 12, the feast of the Virgin of Guadalupe in the Calvary. DancesIn 1870, a group of young, to have fun, organized a gang that are of old boats, shouts and whistles, chanted and danced in the streets spontaneously, covered his face with handkerchiefs or pieces of fabric and dressed in old and torn clothing. This group was given the name "huehuenchis" Nahuatl word meaning "old with worn and torn clothes." It was reported to other municipalities, the town of Tlayacapan; He realized that this dance not only amused the participants but also the people who watched them; therefore, he was again organized with more enthusiasm in 1871, and since then has been held traditionally at the beginning of Lent, or the Sunday, Monday and Tuesday carnival days, ending on Ash Wednesday. Later, this feast was also organized in Tepoztlan and due to the proximity of Cuernavaca, has achieved much fame. In Tepoztlan type of costume was modified, creating a sort of mockery against the Spaniards, as the attire symbolizes the clothing worn by them in the colonial era and the masks have beards and mustaches; these dancers are known as "Chinelos". After Yautepec carnival was organized and the aforementioned places, including some other towns in the state of Morelos. CraftsThey are famous both nationally and internationally Cuernavaca ceramics and wax products; the latter made the product of bees and worked with skill in whimsical figures; pots and pottery of San Anton; bark crushed and turned into amate tree paper with multicolored paints; bags and baskets beautifully woven palm and bright colors; love beads and rare stones; as well as masks and figures of lacquered wood.